Ahoy shipmates! Here's your chance to experience sailing the Caribbean! Our guest writer aboard the Damn Yankee provides a weekly narrative relating the adventures of life at sea. 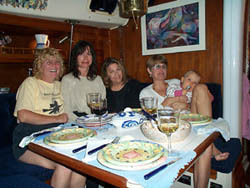 Join the crew aboard the 36' Catalina as her First Mate recounts the exploits of a couple who have moved into the lifestyle many dream of living. 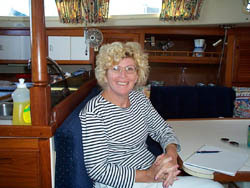 Insightful and compelling, Gwen Schuler will keep us posted in a series of articles and photographs as she and her husband Jim set sail for adventure. Dock here regularly! Like to get your Damn Yankee Updates via email? Sign up now as a member, and you'll be able to get your Damn Yankee updates automatically via email. It's only available to seeBoat.com members. Register Now! It's Free! It's not the leaving of Liverpool that grieves me, but my darling when I think of thee. The dream is now reality. Our ten-year plan has reached fruition. Only the house closing and the installation of radar remain. It's September 6, 2000 already. Where will Jim and I be one month from today? Hopefully, moored in Annapolis harbor ready to scour the sailboat show for the snappiest foul weather gear, hunting down that final waterway chart and purchasing the safest coastal life raft. Two months from now? We'll be underway riding the current through the tidewater of Virginia, soon to be snapping pictures at mile marker zero entering the Intracoastal Waterway headed south. Our ultimate destination; Marsh Harbor, Bahamas, where we've been told it's better. The men nod, their arms folded over the top of the nearest piling. Knowing smiles crack their faces. I watch our same dream coalesce in their eyes. In seconds it's gone, drifting off like the smoke from their cigars. But their smiles stay fixed. The women are tougher. Flimsy smiles through tight lips, I see incredulity arc in their eyes to be rapidly displaced with suspicion. And they are irrepressibly vocal. Our kids are grown, gainfully employed, own a home and contribute to 401Ks. Enough said. The women don't look convinced. 'You'll be homeless,' Mary Sue insists as she clutches her husband's arm and pulls him away. 'What? No car, you have to have a car.' Mary Sue interrupts panic edging her voice. Tension swirls, eddying within the group. I'm verging on apology for even considering such mindless folly when my husband responds to Mary Sue with a smile and a wink. 'But no car…' She whispers with a shake of her head. Art her husband rolls his eyes. Are we women so conditioned to our SUV's and cell phones that all sense of adventure has been socialized out of us? I hope not. Still, I wondered, restless through that night. Watch any man at the helm of a boat, any boat. Their hands ride gently on the wheel an expression of pure pleasure plays across their features as they conjure themselves rounding Cape Horn or making landfall after a long passage. If you're paying particular attention, you're witness to the boy who remains forever within the man. We women are nesters. We may have sand in our shoes but we'd prefer to remain landlocked making our stand on solid ground. We're the hub of the wheel with the attachments of family and friends like the wheel's spokes extending outward but held within the rim of home and community, except for some of us. Funny how I'd never thought of Jim and I as particularly adventurous. We each worked for the same corporations for over twenty-five years. 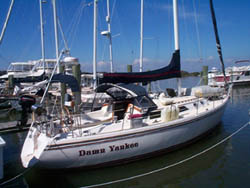 Even after sailing thirteen years, we raise the mainsail on the Damn Yankee, what, three times a season? 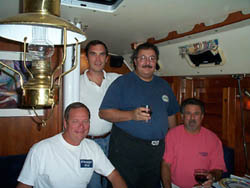 Yet early on, once Jim broached the idea of cruising, images formed. Women can conjure too. I knew then, it would be only a matter of time and money. 'Wagon Train,' I shot back without thinking. 'That's right.' I catch his surreptitious glance at my half full first glass of beer. I meet his gaze. 'Remember the pioneer women? They piled their wagons with barrels filled to the brim with their life's possessions? They took the ultimate risk, leaving the familiar to embrace the unfamiliar? Al lowers his head; the brim of his Panama hat hides his eyes. He takes a long swig of his beer. He knows. So, like the frontier women of a previous century who trusted their dreams to remain safe within the fragile confines of wood and canvas, I'll set out a few of my life's possessions and lay my trust deep into the hull of the Damn Yankee and embrace the unfamiliar. Easier for me than those women, I'll use e-mail, digital phone and camera to expand the rim of my wheel to keep in touch with family and friends. I can leave with the knowledge that there are airports and Priceline.com available. The kids are planning a Bahamas vacation this winter. Cindy pours Rabbit Ridge Reserve all around. 'To the dream.' She raises her glass. We all drink to dreams. 'I'd do it in a minute,' says Sue. 'Not if you had grandchildren…' pipes up Mary Sue.